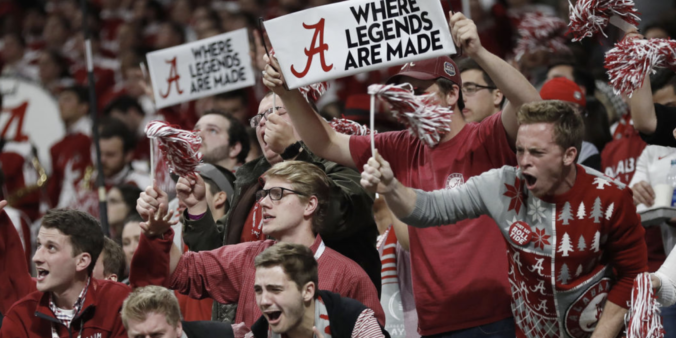 WHITE TRASH, USA – The Alabama Crimson Tide won another National Championship on Monday night, defeating the University of Georgia in dramatic fashion. Trailer parks are rocking throughout America as Alabama fans celebrate another year of vicarious greatness in a destined-to-be-outlawed athletic competition. The Alabama Department of Safety, working out of its satellite office in the Chester’s Fried Chicken facilities on Cahaba Road in Birmingham, announced that it is expecting a baby boom in the coming months, which will result from joyful championship celebration. In an equally significant estimate, Durtt announced that the family trees throughout the State of Alabama are expected to fork at least four times, the largest expansion in statewide genetic diversity in decades. Economists predict an eventual stock surge and economic windfall for Mountain Dew, used car parts vendors, anything denim, and the Blue Collar Comedy Tour. Row Tide, y’all. Row Tide.